I've had so much fun with my blog and it's been such a fun way for me to express my love for fashion! I'm constantly inspired by so many of the amazing blogs I read on a daily basis. I'm still trying to figure out how to balance blogging and work so I'd love to hear tips on how all of you fabulous ladies do it! This past weekend was a bit hectic and I didn't have an opportunity to take outfit pictures. My husband and I were out of town and then to top things off I got sick. It's no secret that I love the simple combination of black and white, so I thought I'd share a few of my favorite "older" black & white looks. New posts to come later this week! I love black and white :) and those red shoes are gorgeous! Love them all! But that polkadot top just makes me happy! 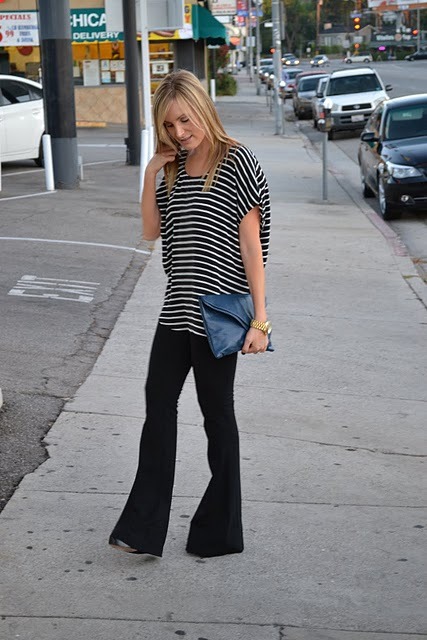 Loving your style... and your blog! Eep, I lovvvve the last outfit! Big polkadots, boyfriend jeans and gorg red pumps?! Brilliant! Totally recreating this look someday! So happy to have found your blog, I can tell already I'm going to find so much inspiration here! & thanks so much for your sweet comment, too! As for finding time and balancing work & blogging, it can definitely be tough. I often end up dressing back up in outfits I've worn during the week to take photos of them on the weekends! Sometimes it's the only way they'll get photographed! Beautiful photos! Gorgeous outfits! LOVE the red shoes!!! You can rock some black and white! Love all three looks. Feel better soon! It's hard to juggle blogging into my busy life. I totally understand. I just do it when it doesn't stress me out. If it does, I take a break. your polka dot top is dreamy! You do stylish chic better than anyone I know! I love all these outfits but considering I had an instant love affair with those vintage levis I have to say that the last outfit is my favourite, plus with a darling polka dot top, how could I go past it! I havent worked out balancing work and blogging yet either but I find that I find a lot more inspiration in little daily things now and try to write my pieces at night, then just post them during the day near home time. You look so good! I completely agree and I am the same way with my love for black and white clothing.. It is never a fail and always looks good..
Hello, fantastic yours looks is beautiful. Lol. Looks like you and I had the same idea this week! :) Love these, darling! You look gorgeous! these outfits are just fabulous. you are gorgeous!